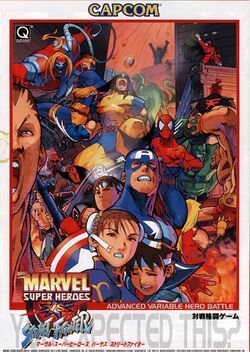 Marvel Super Heroes vs. Street Fighter is an arcade game developed by Capcom in 1997, and is part of the Marvel vs. Capcom series of fighting games. In an attempt to address some of the problems present in the previous games, the game engine was tweaked, but remained aesthetically the same. The game was ported to the Sega Saturn in 1998 and PlayStation in 1999. Apocalypse re-appears in the game as a sub-boss; after defeating him, your team will face a mechanized, super powered form of Akuma called Cyber Akuma (Mech Gouki in the Japanese version). Although the fight is two against one, he makes up for it by having overpowered strength and speed. The character that can beat Cyber Akuma will have his or her ending viewed upon completion. This game has a notable number of secret characters, including a joke character named Norimaro. He is only available in the Japanese version, occupying a center space which is replaced by an unselectable logo in the American version. He portrays a nerdish, cowardly schoolboy-type guy armed with a camera and is based off Noritake Kinashi, Japanese comedian. Just as the previous game, X-Men vs. Street Fighter, the Sega Saturn version, released only in Japan, was a complete 100% translation of the arcade game. The PlayStation port was similar to the previous port of X-Men vs. Street Fighter with noticeable improvements that masked the limitations of the PlayStation hardware. Due to the limited RAM of the PlayStation only 2 unique characters in one battle can be used to switch. For instance Captain America and Spider-Man would face off against Spider-Man and Captain America. This is also true in two-player Crossover mode. Animation was improved over the previous installment and sound was no longer glitchy, but still paled to the Saturn version. This page has been accessed 55,567 times.